In early 2014, the political crisis in Ukraine spilled over into a financial crisis. The IMF was called in and faced an exceptionally difficult situation even by IMF standards. Departing from established norms, the IMF in April approved a conditional lending arrangement with a country in active conflict and dealing with deep-seated economic problems long in the making. This talk will present an analysis of the problems Ukraine had built up over decades of mismanagement, the stark financial crisis that the country faced in early 2014, and the rather short-sighted approach the IMF adopted in defining its role in the lending arrangement. The IMF now faces a range of difficult questions that it must agree on with the new Ukrainian government, with countries that will need to provide bilateral assistance, and with private creditors. Susan Schadler is a senior fellow at the Centre for International Governance Innovation (CIGI) in Waterloo, Canada. Most of her work centers on global governance and institutions for addressing sovereign debt crises and the handling of the ongoing crisis in Europe. 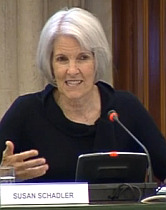 She also has an active interest in macroeconomic diagnostics, especially in emerging market countries where policies must be responsive to the pressures of capital inflows, current account imbalances and sustainability and she continues her interest in Central and Eastern Europe as a member of the Advisory Council of the Center for Economic and Social Research in Warsaw. Susan Schadler’s work builds on her experience during a long period at the International Monetary Fund where she was Deputy Director of the European Department until 2007. She led the IMF’s teams working with governments in Central and Eastern Europe, Turkey, the UK and Germany. She also worked in the IMF Research Department (focusing on exchange rate and SDR issues), Asian Department (Head of divisions for India and Thailand) and Policy Development and Review Department (where she stablished the ex post evaluation division).